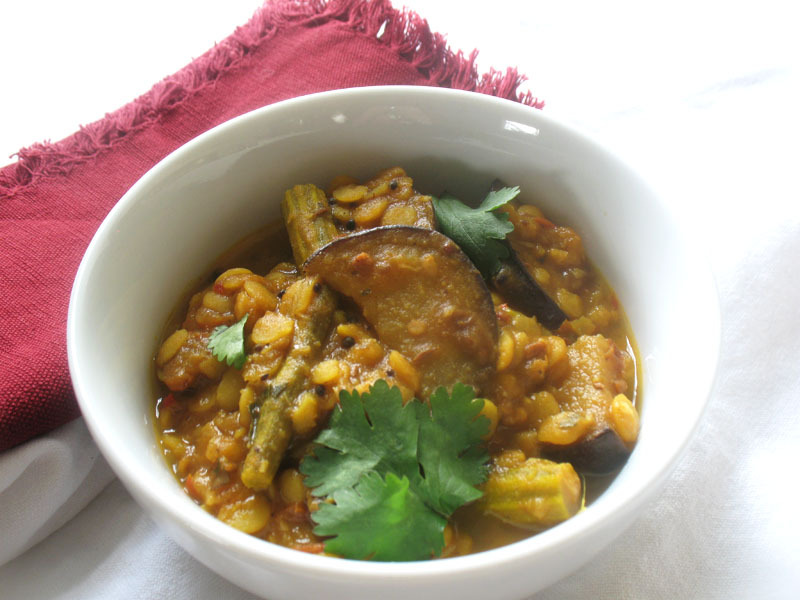 When I first began cooking Indian food, most of my dishes were inspired from classic north Indian cuisine. 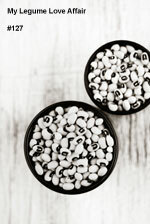 As I became more comfortable with spicing and my curiosity expanded, southern Indian creations soon became a passion. 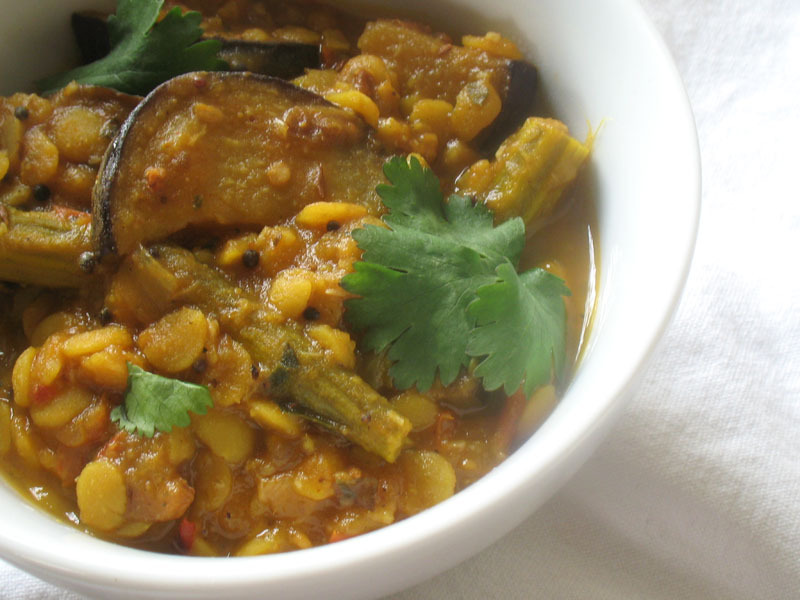 Sambars are a signature part of south Indian eating, typically serving as the first course of the meal along with rice, followed up by a brothy rasam and other vegetables dishes, such as poriyals. These thick soup-like creations can be made with any number of vegetables and are typically served with rice and other accompaniments. 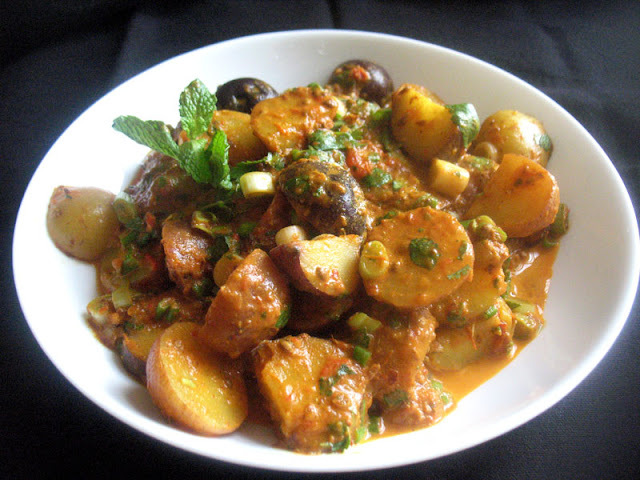 But sambars are substantial enough to serve as the main course of a meal, especially when served with rice and some Indian flat breads. Drumstick features in this sambar. This is only the second time I have cooked with this vegetable — the first time it starred in a vegetable coconut sambar, but I'm already a fan. A long thin green pod, they are commonly used in Indian cuisine, often featuring in sambars as they do here. The flavor and texture of drumsticks is quite unique. If possible, it is best to find immature drumsticks as they tend to be even woodier and more fibrous the older they are. As it is, most of the skin is removed before cooking and they are sliced into pieces before cooking as it is the soft pulpy interior that makes the vegetable so enjoyable to eat. They're also highly nourishing as sources of calcium, iron, phosphorus and vitamins and used to be used to treat malnutrition in Asia. Drumsticks can be found at Asian and Indian grocery stores. Look for the smoothest pods you can find. If you can't find drumsticks you can use any vegetable that you have on hand, such as carrots, green beans, radish, asparagus or sweet potato. This dish would still be delicious, but I would highly recommend the seared eggplant even if not using drumstick. It adds a unique final lovely texture and touch. You can also easily find prepared sambar powders at Indian grocers, but it's easy to make at home too. Thoroughly rinse the toor dal. Transfer to a medium bowl, cover with cold water, and let soak for 1 to 2 hours. Meanwhile, soak the tamarind pulp with 1 1/4 cups of hot water for 30 to 40 minutes. Strain the tamarind liquid into a bowl, squeezing out as much liquid from the pulp as possible. Discard the pulp and set the liquid aside. Drain the toor dal and transfer to a large saucepan along with the tamarind liquid, sambar powder, turmeric, paprika or cayenne, shallot, tomato and 1 cup of water. Bring to a boil, reduce the heat to low, cover, and simmer for 20 minutes, stirring occasionally. Add the drumstick and simmer for another 20 minutes, stirring occasionally and adding more water as needed. Cook until the dals are soft and the drumstick is tender. Meanwhile, cut the eggplant into 1/4-inch thick rounds or half rounds depending on the size of the eggplant. Lightly salt and set aside for 15 minutes to firm up slightly. For the tempering, heat the oil in a large frying pan over medium heat. When hot, add the mustard seeds, cumin seeds and fenugreek seeds. Stir and fry until the mustard seeds turn grey and begin to splutter and pop. Add the curry leaves and fenugreek leaves to the pan, stir a few times, and then add the asafetida, chilies and ginger. Stir for a minute and then add the eggplant slices. Fry the eggplant until golden on both sides, stirring occasionally. Transfer the eggplant mixture, along with the coconut if using, into the cooked dal and stir well to combine. Simmer for another few minutes to blend the flavors, then stir in the lemon juice and salt and serve hot garnished with fresh chopped cilantro alongside a bed of fresh cooked basmati rice. Most of my coworkers are both South Indian and vegetarian, so I've become obsessed with the cuisine! I'll have to search out drumstick the next time I'm at an Indian grocer! What a great meal. 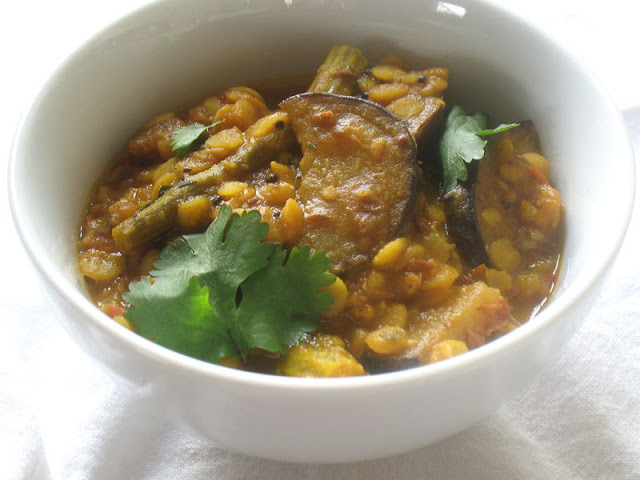 Nice Sambar recipe with eggplant. I love sambar.